President Trump’s opioid commission released its final report Wednesday, an ambitious list of over four dozen recommendations aimed at treating addiction, preventing overdoses, and further restrictions on opioid prescribing. “This crisis can be fought with effective medical education, voluntary or involuntary changes in prescribing practices, and a strong regulatory and enforcement environment,” the commission said in its report. The president established the commission in March to give him a list of recommendations to combat drug addiction and the overdose crisis. “Our people are dying. One hundred seventy-five people a day, every day, are dying in the United States from this epidemic,” said commission chairman Gov. Chris Christie of New Jersey, one of five politicians who served on the six member panel. The commission’s 131-page report did not spell out how much money would be needed to implement the panel’s wish list of 56 recommendations. Chief among them was to get drug makers and the National Institutes of Health to work together developing new non-opioid painkillers and addiction treatment medications. “It is inexcusable that the major pharmaceutical companies in this country have stood on the sidelines during this crisis. And they have,” said Christie. The commission is also recommending that a new set of guidelines for opioid prescribing be developed to “supplement” the guideline released last year by the Centers for Disease Control and Prevention. It was not immediately clear if the new guidelines would replace, weaken or strengthen the CDC’s recommendations, or simply expand their use throughout the healthcare system. “An updated set of guidelines for prescription pain medications should be established by an expert committee composed of various specialty practices to supplement the CDC guideline that are specifically targeted to primary care physicians,” the report says. The commission urged the federal government to work with states to improve the toxicology data on overdose deaths by developing uniform forensic drug testing. Critics say the current data now being used by federal agencies is flawed or cherry-picked. “We do not have sufficiently accurate and systematic data from medical examiners around the country to determine overdose deaths, both in their cause and the actual number of deaths,” the report says. The commission did not recommend that supply limits be placed on opioid prescriptions for short term pain, as many expected. Several states have already enacted 5 or 7-day limits on opioids for acute pain. The panel also did not endorse the development of marijuana-based medications, which many pain sufferers are now using as an alternative to opioids. 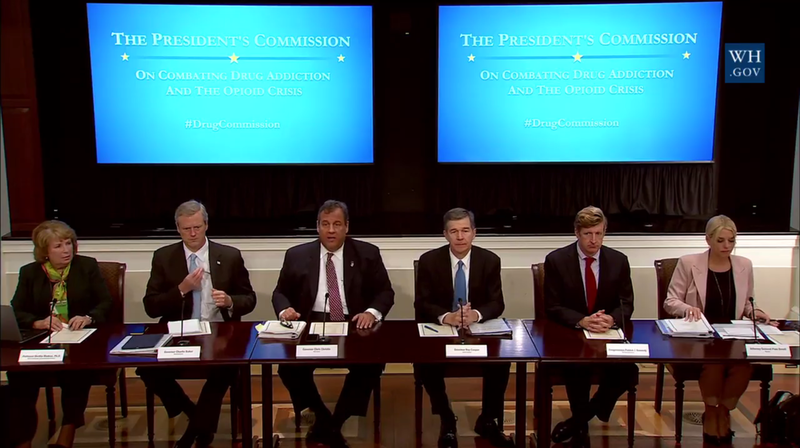 Most of the commission’s other recommendations deal with cracking down on drug traffickers and the illicit drug market, expanding the drug court system, and increasing access to addiction treatment. Gov. Christie refuted criticism of President Trump for declaring the overdose crisis a public health emergency, instead of a national emergency. Only $57,000 in federal funding is currently set aside to deal with a public health emergency. “The president did exactly what I asked him to. I wanted this to be a public health emergency because I wanted HHS (Department of Health and Human Services) to administer the funds, not FEMA (Federal Emergency Management Agency). No offense to FEMA. They’re busy with some other things and it’s not there area of expertise,” Christie said. In addition to Christie, commission members include Gov. Charlie Baker of Massachusetts, Gov. Roy Cooper of North Carolina, Florida Attorney General Pam Bondi, Bertha Madras, PhD, a professor of psychobiology at Harvard Medical School, and Patrick Kennedy, a former Rhode Island congressman. In its fifth and final hearing, the commission heard testimony from several people who lost loved ones to opioid addiction and overdose. The panel never asked for or received testimony from pain sufferers, patient advocates or pain management physicians.